"Your passports, your passports!" the man shouts, speeding over to us on his scooter. We're loading our bikes on the ferry to Phú Quốc, heaving them over a railing at the front of the boat, but I turn around to see him approach, lifting his helmet upon arrival. Then, uttering a final, breathless "passports…" he hands over two navy blue American IDs. My mouth hanging agape, I accept them and try to thank the man, but I am in shock. Before I can even express my gratitude, the manager of the hotel we stayed in last night rides off. The whole exchange happens so quickly that Tyler, still working with the ferry staff to load our bikes aboard, isn't even aware of our drive-by. I get back to helping out, and then, when we're all settled on board, I tell Tyler about the kindness of our hotel's staff. Phew! Disaster averted! With just a few minutes to spare before our boat leaves, Tyler runs out to buy us breakfast. Not only did we forget our passports in a rush to make the ferry on time, we haven't eaten yet either. He returns just in time, with a pair of iced coffees and two egg sandwiches. 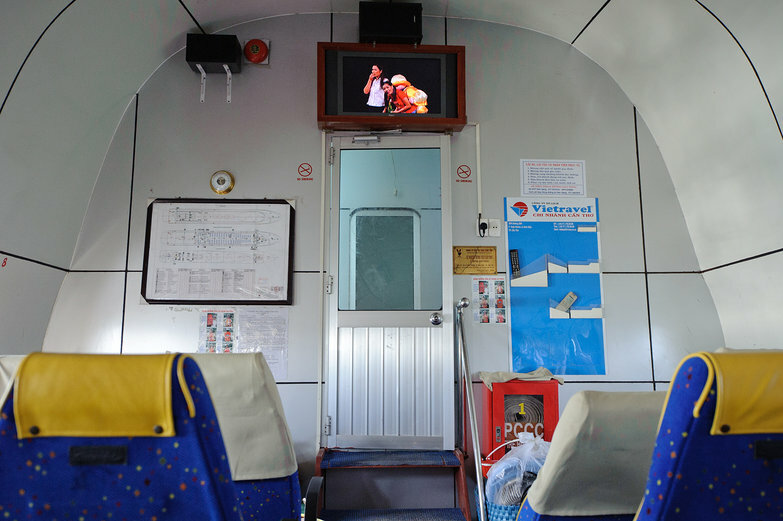 While we peel back the napkins wrapped around our breakfast and begin munching, the boat fills up with passengers, and a television at the front of the cabin is turned on. As we cruise out of the port, people lean towards the isle, trying to get a better view – some sort of live theater or comedy performance is playing. The show is loud, and lands on my ears like uncomfortably rising and falling pitches of gobbeltygook. The sound, combined with a constant bassy drone emanating from the ship's engine prompts me to remove my headphones from the handlebar bag and shove them in my ears. We space out for the remainder of the ride. Tyler sleeps, and I try to sleep, but instead feel woozy and nauseated from the boat ceaselessly rocking from side to side in what seems like a 180° arc. Landing on the east side of Phú Quốc, the waters are crystal clear and shimmering. Palm trees grace the coastline, swaying gently in the breeze, and the sky is an obscenely rich color of blue. We have an eleven kilometer ride ahead of us to get to the west coast of the island, where the only real town is. For some reason, I think the other side of the island is about thirty kilometers away, and that getting there will involve climbing a mountain pass. 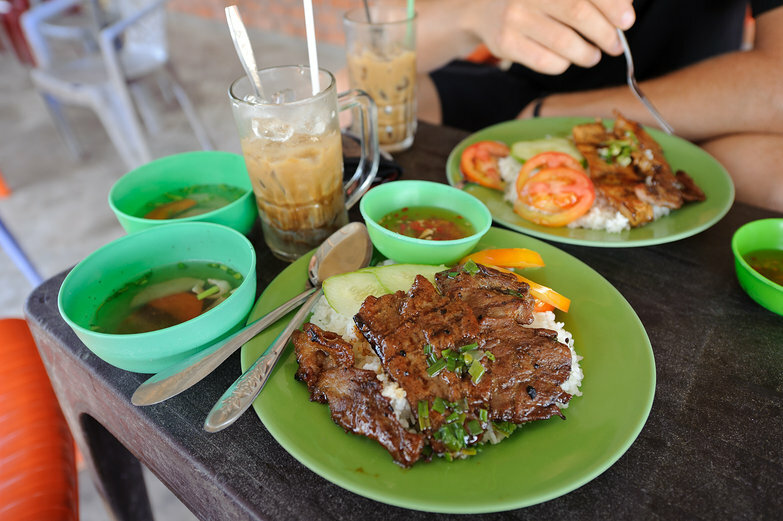 So, we fuel up on even more iced coffees, and two plates of delicious Vietnamese grilled meat. These come with rice, sliced raw vegetables, and little bowls of thin, peppery, brothy soup. A tiny dish of fish sauce with slices of red chilis tops it all off. Yum! Pedaling away from the port, we're anticipating something like Elba, but what we find is a few rolling hills, and a road much shorter than expected. Soon we've reached the island's only real town, Đông Dương, and begin winding our way down a coastal road lined with hotels. We're looking for a place to stay and work for a few days, and we want it to be cheap, clean, and friendly, with wi-fi and beach access. Eventually we find just the spot: a cluster of rustic rattan huts perched on a green grassy slope among dozens of palm trees. Though the only available bungalow (the closest to the beach) is a bit more expensive than we'd like, it's the cheapest place we can find, and it meets the rest of our criteria. So, after checking in at reception, we roll our bikes down a small slope to our little beach hut, chatting to one another excitedly about our new surroundings. Holy crap, this is so beautiful!! 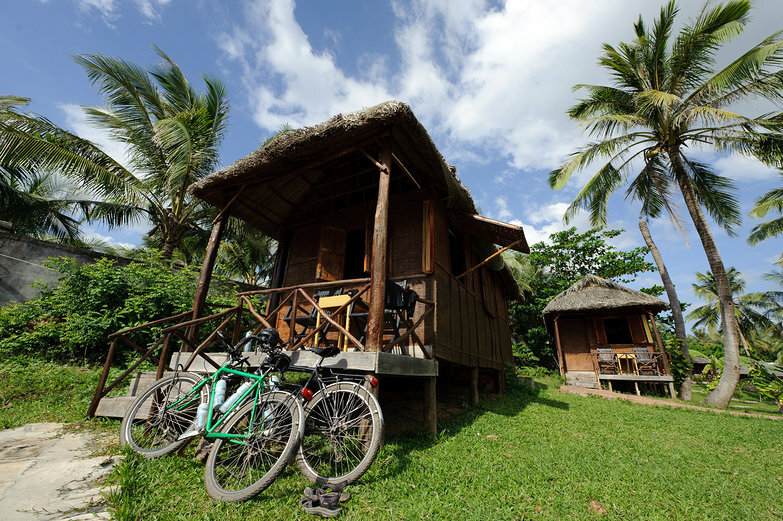 Before moving in, we park our bikes out in front of our bungalow, kick off our sandals, and run in our cycling gear down towards the beach. We pass the very relaxed restaurant and bar where no one is hanging out, and then we're on the beach, where a total of three people are sunbathing. One other person is swimming in the clear, turquoise waters. This is immeasurably nicer than the beaches at Sihanoukville, and there are zero people trying to sell us stuff! It's quiet, it's peaceful, and we have it practically to ourselves. We are in heaven! 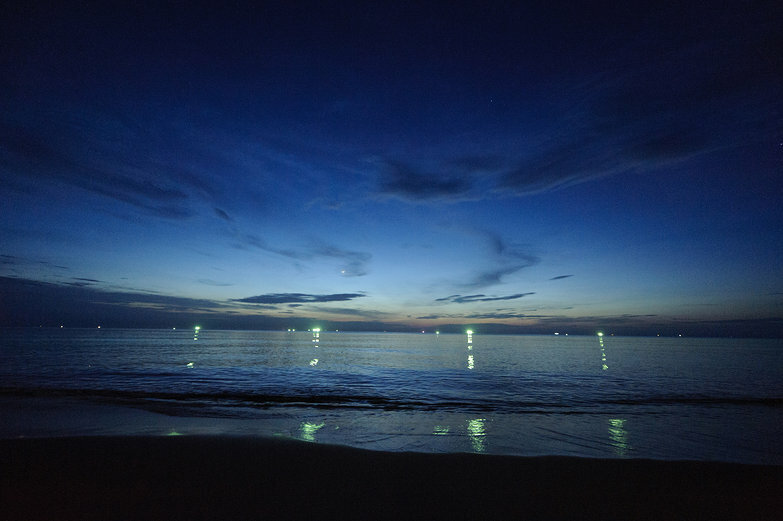 Night has fallen on Phú Quốc. The air is filled with the soft in and out rushing of waves, and the low churning of distant fishing boats, plying the dark waters in search of squid. As we lean back in reclining canvas chairs on the beach, beers in hand, digging our feet in the cool sand, we can hardly contain our excitement about being here. 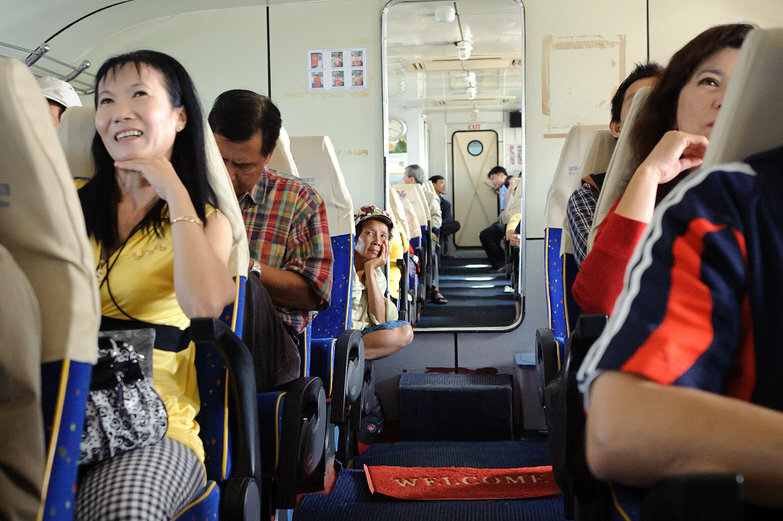 Lately, it seems like Going Slowly: Southeast Asia is becoming Going Slowly: Vacation.